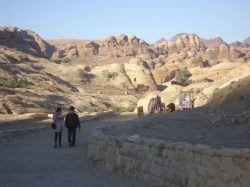 One of the surprises in Jordan was that we had an extra person on our bus, a tourist service police officer. Mo said that they have been trying to do this but that the buses they are on are totally random. So some tourists get them and some don’t. 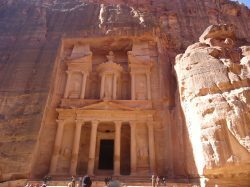 The entrance to Petra was right outside our hotel. 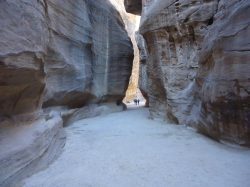 Petra itself is truly breathtaking and amazing. Its history is incredible as well. The Nabuteans who created this site were, according to Mo, truly ahead of their time in many areas. In their engineering they created from top to bottom.In other ways they appear to have been open to diversity of different faith traditions and religions. They also appear to have treated women as equals. Nobody really knows what happened to them. The entrance into the section where the library is takes your breath away. There are barkers everywhere trying to get your attention to buy their stuff. 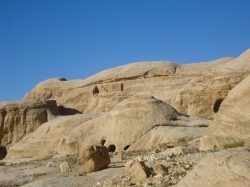 Many of them are families who used to actually live in these caves. 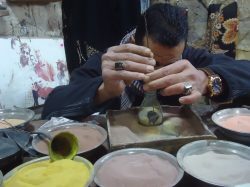 The government has provided homes for them but many come back every day to sell things, provide camel rides, donkey rides and even a chariot ride back to the main entrance for tired travelers. Several of us managed to hike to the monastery-over 900 steps…on my fitbit it said that entire walk was 25,000 steps! Along the way we got to see how they make sand art, pretty amazing. The one concerning piece for me and Mo warned us to not to buy from them, are the children who are here trying to sell things instead of being where they should be, in school. Also I am not sure how well they actually treat the animals that we saw. 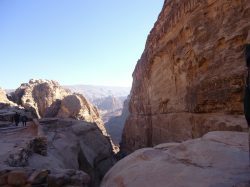 The view from the monastery was truly amazing. I know I am saying that a lot in this missive but it was absolutely awe inspiring. If I remember correctly in the distance you can see where they believe Aaron’s tomb is. Our first stop was at Al Shakur built in the 1100’s-it was a crusaders castle. 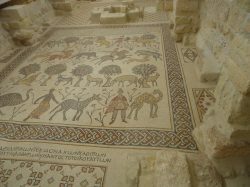 Next we headed to Madaba and saw St. George’s church which is known for its mosaics. 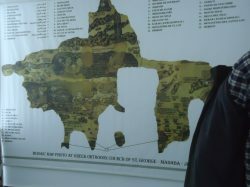 We saw an old map that showed us the pilgrim’s path of travel. Then we traveled the Desert Highway to Mt. 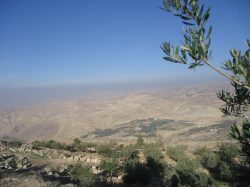 Nebo where it is believed that Moses traveled to and saw the Promised Land but was not allowed to enter it. Unfortunately it was a bit misty the daywe were there and so we couldn’t see as far as you can when it is clear. Still a beautiful view-normally you see as far as Jericho or Jerusalem. We stopped at a place that made mosaic art. 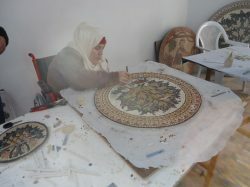 I love the tree of life design and find it fascinating how important it is in both Islamic and Christian art. At the end of the day we came to Amman which is a very large city and very modern appearing, especially compared to the rest of the country. Most places you could truly feel what life had been like for those who lived here centuries ago. We had a lazy morning since we’ll be heading home tonight/tomorrow morning-flights in the 2AM range. 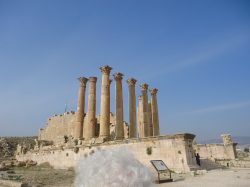 Then we headed to Jerash where we saw more Roman ruins. There we saw Apollo’s temple and Aretemis’ temple. Hers was actually larger than Apollo’s. It was interesting to look up from the site and see the town built near the edges. Mo took us to a really good restaurant that evening. The meal was truly one of the best we ate. Although other than the food we ate at the hotels, which are what you expect it to be, everywhere we ate was pretty good. As a vegetarian I never found myself to be hungry. Mo left us there and Akhmed took us to the airport. We picked up someone who was helped us through customs although that was a little awkward since he wasn’t where we expected him to be and our driver’s English wasn’t good enough to explain what was happening but in the end we all made it to the airport and through customs. Indeed I went through 6 different security checkpoints in all before arriving home. As I reflect on the journey that we took through Jerusalem especially, I am thankful. I am thankful for the members of our group-they are all amazing awesome people who I really enjoyed getting to know. I am thankful for Morgie and Yousef and Yahzen who were funny and inspiring and knowledgeable. 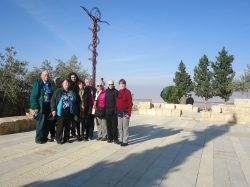 I think that there is something important about traveling to places like Israel and seeing for yourself the “truth” of an area, or as much truth as you can find in the days we were there. Walking through the gate to Ramallah, being stopped by the IDF at a checkpoint, boarded, the tension on Yousef’s face and throughout his body, bring home like nothing else can what people are experiencing day in and day out. The rooftop containers for water stand checkered along the countryside point out in mute ways the Palestinian situation in ways that we often don’t realize or see. The hope that we saw in many, on both sides, of finding a way to not just co-exist but to make things better that often stands side by side with the despair of an unknown future. If I could say to anyone who was thinking about going and undecided, I’d tell you to go. There’s nothing like the actual experience to truly learn so much about people, a culture, and history that is not complete without each other’s stories: Christian, Jewish and Muslim, together make a mosaic that could speak to much of the divisiveness in our own nation today.